The retail binary options market is really booming and as a result the competition among binary options brokers to secure customers is fierce. Existing as well as aspiring binary options traders are bombarded daily by new entrants in the market and are often puzzled by the plethora of offers, confusing them as to which broker to choose. On binaryoptionswire we often feature reviews of what we consider to be reliable binary options brokers and we have also published extensive content on the determining factors that should guide one’s decision as to which broker to choose. In a nutshell, and although we do recognize the importance and weight of individual benchmarks when comparing brokers, we can safely argue that the single most determining factor is the overall customer satisfaction that is offered and enjoyed by traders. Taking into account the opinions and feedback we have received from our valuable readers and visitors over time, we have decided to launch our prestigious Overall Customer Satisfaction Award that will be awarded to those brokers who are deemed by our visitors, who are active binary options traders, as providing them with exceptional standards of service, leaving them entirely satisfied as customers. The aim of launching this award is twin-fold. The first is to give all the visitors of our site yet another chance to voice their mind and opinion through filling our online questionnaire and indicating and rating the level of service that they have received from various brokers, helping us and other interested traders to discern who are the best brokers around and who they should prefer. The second purpose of this award procedure is to recognize and reward those brokers who put customers first by going out of their way to deliver on their promises, by behaving ethically and responsibly and by showing in tangible manners that they respect and value their customers. We strongly believe that mutual trust is a necessary pre-condition for successful transactions and those brokers who see the person and his/her needs in the face of every single trader rather than a mere number on their clients’ list should be brought to the fore and applauded for their efforts and way of doing business. To participate in our awards procedure, please click here to access the online voting form in order to be able to share your experiences and give your vote of confidence and appreciation to those brokers that you are convince are worth it. We have attempted to include in the questionnaire all those parameters that we feel are important and that make up the overall customer satisfaction criterion. If you feel that we have omitted anything or wish to make any comment or suggestion regarding the awards, please send us an email and we will be more than happy to include your contribution. This will be an ongoing process and winners will be announced at regular intervals. We strongly encourage you to cast your vote and help those brokers who serve you best get acclaim and be distinguished, as a way for all the satisfied binary options traders out there to thank the brokers who are always by their side and help them place successful trades and achieve profits. 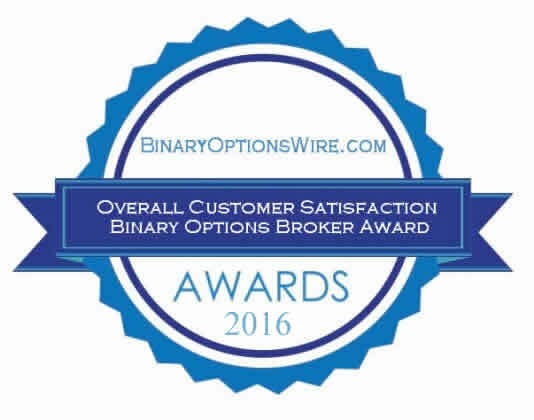 The first ever BinaryOptionsWire Overall Customer Satisfaction Award for Binary Options Brokers is duly awarded to BinaryTilt. After collecting and processing the information from all those who filled in the relevant questionnaire, the team of binaryoptionswire.com is pleased and proud to announce that the winner of our Overall Customer Satisfaction Award for Binary Options Brokers for the year 2015 is BinaryBook.